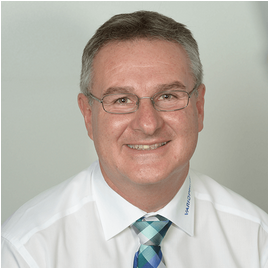 A market requirement or a marketing tool of the PCB industry? The topic of ultra-fine line technology is lively debated in professional circles. However, not everybody understands it to mean the same thing. There is no common standard and the definition allows ample room for interpretation. To begin with: ultra- fine line technology does represent a genuine market requirement. The steadily growing demands can only be satisfied by great investments in machinery and infrastructure. 1. What is an ultra- fine line conductor? At VARIOPRINT ultra-fine line conductors are all conductor tracks, which are smaller than the current standard conductor tracks. And this is where the confusion starts, as the definition is not fixed, but is continuously adapted to the current production status. Thereby a constant conductor line width and spacing is used to describe the situation. (line/space ratio) At present VARIOPRINT labels a line/space ratio of <75 µm as ultra –fine line technology. 2. Why ultra-fine line conductors? The actual challenge to ultra-fine lines is however dictated by the integration density of the currently available integrated circuits. 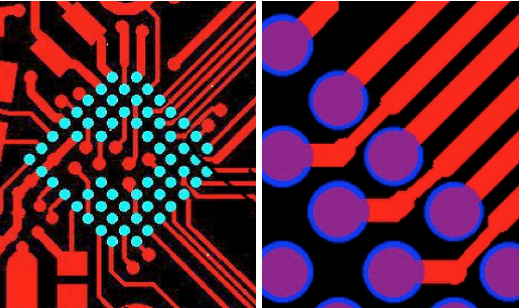 Thus Ball-Grid-Arrays (BGA) with spaces of 0.4mm are not uncommon today. To be noted are the pad sizes of 200-300µm resulting from that. An additional challenge in this area is the precise positioning of the solder resist mask. 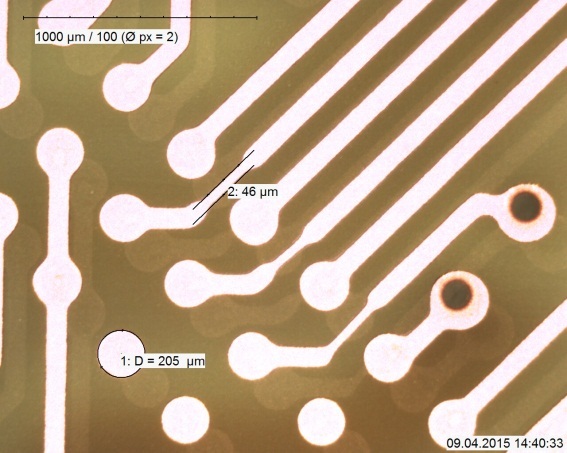 Resulting from the pad sizes and the solder resist bulging we presently have circuit tracks of 50µm between the pads. However, in future we will have to be able to produce circuit tracks of 25-30µm to implement the next design generation. The production of ultra-fine lines has been intensively advanced in the previous years. Extensive analyses using rigid laminates as well as flexible materials have been carried out. In particular thinning out and etching processes, conductive pattern combinations and preceding and following processes have been examined thoroughly. The results we have seen so far are promising. With our recent investments in electro-plating and laser imaging technology we are now able to achieve very good results with high process reliability. It is however crucial that the collaboration between the layout designer and Varioprint starts at an early stage, so that the design requirements and the production processes can be coordinated optimally. The example «Aspect Ratio» (the ratio of drilling depth to drill-hole diameter) clearly shows the importance of a close information exchange already in the early stages of development. 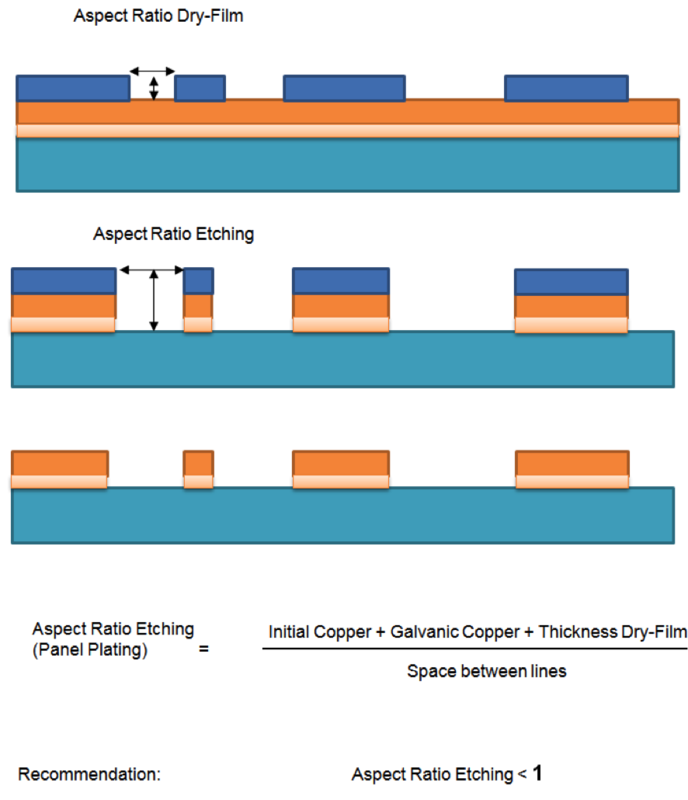 > It is crucial to take into account the aspect ratio in etching: in etching processes the copper and resist thickness in relation to the conductor track space must be monitored. The rule of thumb is: the height of the conductor track including resist should not exceed the conductor track spacing. We will happily give you advice and support in all your projects. Benefit from our 45 years of PCB know-how! Do not hesitate and get in touch with our experts at an early stage. In the past months we have systematically analyzed the recent processes and materials relevant to the production of ultra-fine line conductors. The latest investments in electro-plating technology and in laser imaging technology provide the necessary process reliability for a successful realization of ultra-fine line conductors. VARIOPRINT is already able to produce ultra-fine line conductors ranging from 30 – 40µm in compliance with the above mentioned framework conditions and using the presently available resources. In the next two years specific investments in our equipment will be made, which will enable us by applying new materials and tools to advance to new innovative horizons of ultra-fine line designs. 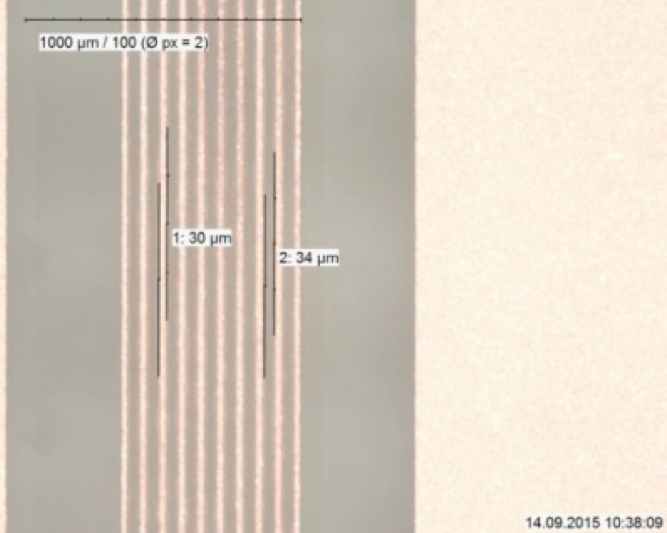 Our target: conductor tracks of 25 µm width, which can be mass-produced. Further information to Ultra-fine line technology.